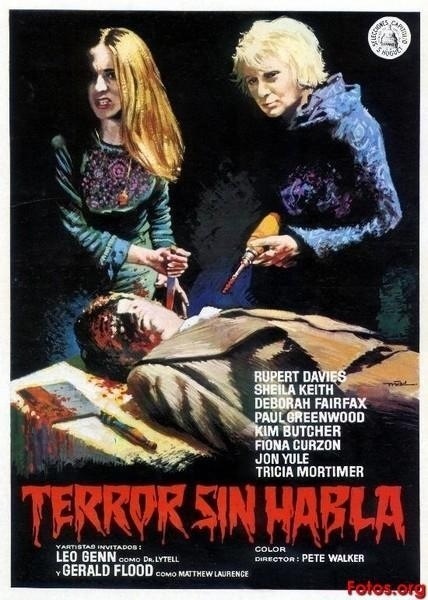 Released in 1974 Frightmare has often been dubbed the UK version of the Texas Chainsaw Massacre and while these two films have a couple of things in common they’re also very different. As I write this review this is the 4th film by Pete Walker that I’ve seen. Schizo and the Comeback were ok films that had potential, but were a little sluggish in pacing and in the end were simply ok films that didn’t reach their fullest potential. The House of Whipcord was an excellent film and that’s the film that really made me a fan of Walker. 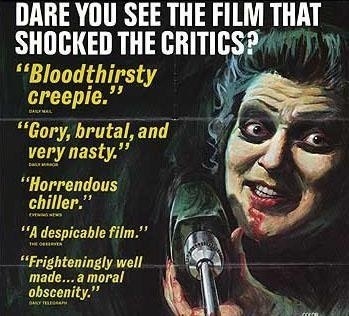 Frightmare is one of those sneaky good films. It starts off ok and as the film goes along there really isn’t anything special about it, but by the end I was totally hooked. In 1957 Dorothy Yates (Keith) and her husband Edmund (Davies) were sent off to an insane asylum for a series of brutal murders. Now released they live in a remote village, but soon Dorothy is back to old ways luring people to her house and killing them. The screenplay by David McGillivray based off a story by Pete Walker is as much a drama as it is a horror film. For the good majority of the first half the focus is more on Edmund’s daughter Jackie (Fairfax) who is looking after her younger and rebellious sister Debbie (Butcher). Jackie also checks in on her father and stepmother and like I said the script is very much a drama early on and while in someways this does slow things down, but it also adds a lot of depth to the characters as well. For the most part, Frightmare is cleverly plotted and well written. Thus far of the 4 films I’ve seen by Pete Walker the biggest problem I’ve had is the pacing can sometimes be a little sluggish with the exception of House of Whipcord. Sometimes a films biggest asset can also be its biggest flaw. In Schizo it mixes horror and drama and the same can be said about the Comeback and the horror elements themselves are a mixture of slasher and ghost story. I guess what I’m getting at is I like the fact Walker attempts to add more depth to his films, but they can sometimes lack an identity. Frightmare follows in tune with that as its very much a family drama through the first half and even the 2nd half it still plays a large part. The pacing of Frightmare can be a little sluggish in some spots, but never boring and with that said though there are moments where you might wonder where this is all going. The first onscreen murder doesn’t happen until the 54-minute mark. However be patient because when the final act comes all the family drama is very much worth it as this really adds to the intense final act, which featured some great suspense as there were plenty of tense moments with a total shocker of an ending. I also love the visual look of the film towards the end with the bluish tint used outside of the farmhouse as this really adds a layer of tension. 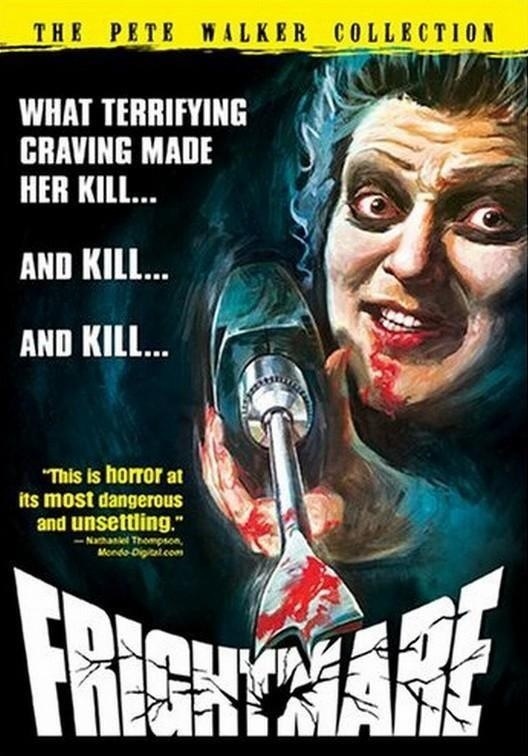 Frightmare though is most noted for its graphic violence and sure there is plenty of carnage on display and of all the films by Pete Walker I’ve seen this is probably his most violent, but its not as graphic as most cite. I suppose for 1974 there is a lot of carnage, but I can think of many films far more violent around this time or even before it. Though some deaths are nice and brutal with almost a meanness behind them, which in part makes them a little more shocking than they actually are. House of Whipcord is still my favorite Pete Walker film, but Frightmare is very close behind. Like I said through some of the film you might be wondering where all this is going, but just be patient as its all worth it at the end. 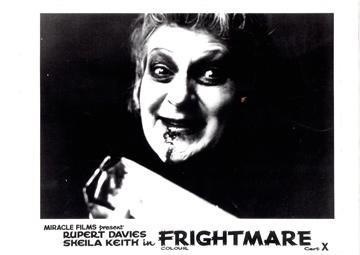 All the performances are quite strong, but Sheila Keith is brilliant as Dorothy Yates; she’s amazingly creepy and she’s also worked with Pete Walker on a few other films and she was great in those as well, but this was by far her creepiest role and its a shame she’s sort of forgotten. I’d rate her as one of the great horror actresses who deserves far, far more credit than given. The rest of the cast is also excellent in their roles with Kim Butcher besides Sheila Keith being the standout. 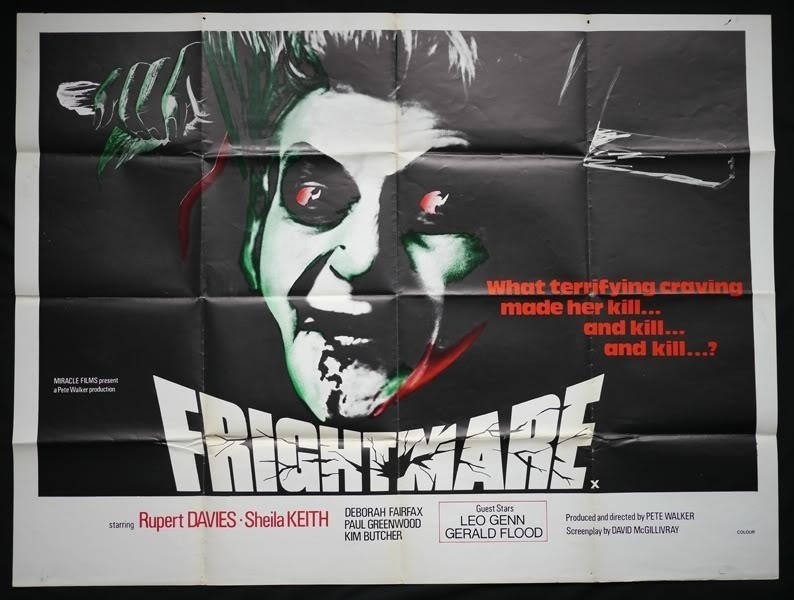 Overall Frightmare is an excellent film and the film is sometimes dubbed a Texas Chainsaw Massacre knockoff is way off base and for the record both films were released the same year. In someways, Frightmare can be a little slow and like I said before you might wonder where this is all going, but when it gets there you’ll better appreciate the first half of the film. Frightmare is creepy with a brilliant and chilling final act. Frightmare like many European films goes under many different titles. Alternate titles were a little more common in non-English speaking countries, but Frightmare also goes under the title Cover Up, Once Upon a Frightmare and even Frightmare II. Back in 1983 there was another film titled Frightmare and its common sometimes for distribution companies to bill one films as a sequel even if unrelated. Peter Walker’s Frightmare pre-dates the 1983 production by 9-years!